Fava beans are among my springtime favorites. As delicious and versatile as favas are, I wish they were faster to prep. At my farmers market, growers sell sweet peas, shelled, in large bowls for scooping. Not so for favas. But let’s not get discouraged. This is a super easy recipe. Once the favas are shelled and lightly cooked, this is totally worth the fava time. If you want, shell the favas a day ahead and refrigerate. Fava beans from the Mountain View CA farmers market. Raw favas in and out of pod. Cooked favas with skins removed. Split fava pods with your fingers and remove beans. In a 4-quart pot, bring water to a boil; salt lightly. Add favas and cook for 2-3 minutes. Remove with a wire strainer, rinse with cold water and drain. Slip skins off favas and discard. Meanwhile, keep water in pot simmering. Melt butter with olive oil in a large skillet. Add sage and simmer very gently. Meanwhile, add ravioli to pot of boiling water. Cook as directed, 2–6 minutes depending on the brand and size of ravioli. Note: The cooked ravioli will be a bit green from the favas. If you prefer, use a fresh pot of water. 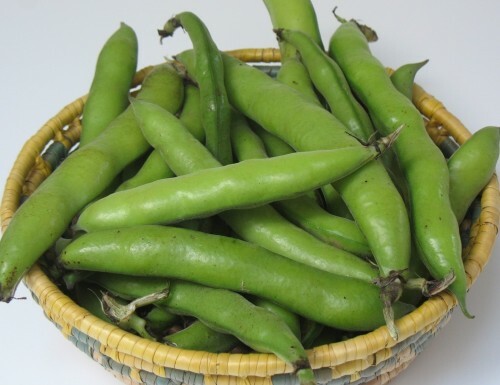 Did you know the fava pods are edible? I just learned this from a local chef. Simply trim ends, sliver pods and sauté in olive oil until tender. From what I understand, the pods are edible if they are VERY young. The typical big ones you see at farmers markets are too mature and super chewy (but you do get more fava beans with them). After all, it’s the favas that are full of flavor. I love favas too but dread the prep! But now I’ll look forward to the next delivery in my CSA box. Glad you said how many pods to use, it’s hard to tell how much one will get from a pile of favas. 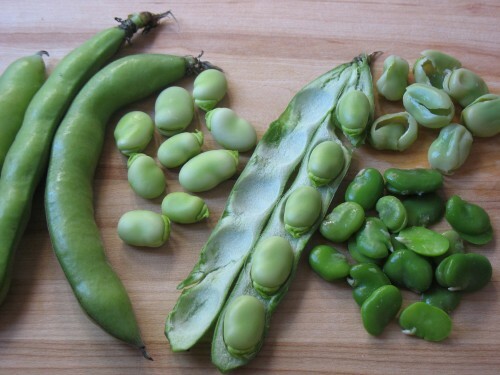 A large, mature pod will typically have at least 5 fava beans. Look more closely at one of the photos; you’ll see what I mean. It IS yummy, and easy. 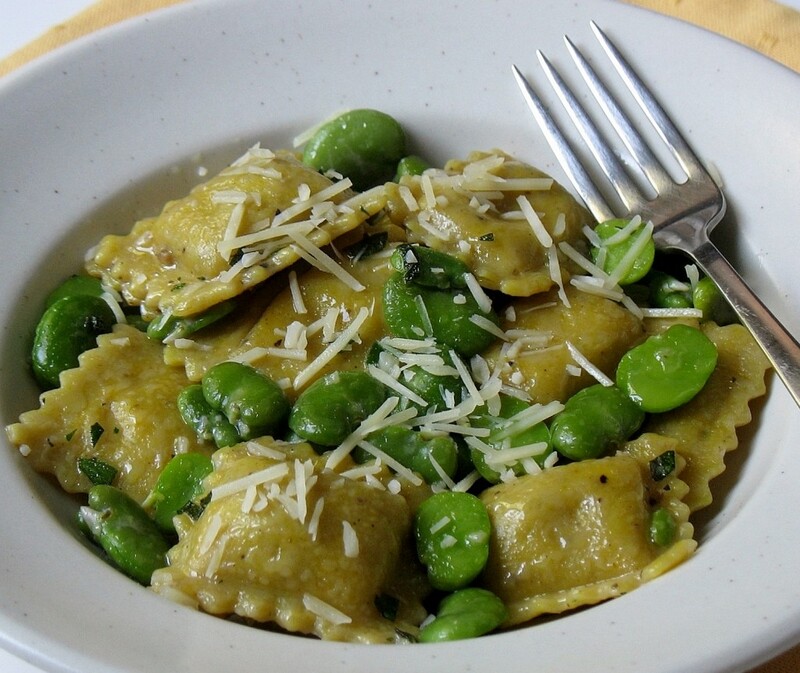 The greenish hue on the ravioli is because it’s cooked in the same water used for the favas.